Not long since iPhone 4S has been released, some users have experienced problems with the battery life. Apple has confirmed that battery performance actually has a few problems and they’d release a software update as a solution in a few weeks. 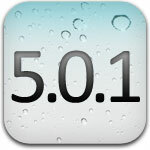 Finally, the iOS 5.0.1 update has been released, bringing fixes to iPhone 4S battery life. Apple says that the update fixes problems with Documents in the Cloud and improves voice recognition as well, which had problems also. For the first time, you can update your device without connecting it to your computer. It is very simple, go to Settings > General > Software Update, and then tap the Download and Install button.